Consulting my oracle deck, The Halloween Oracle, for insight about the cumulative effects of Mercury and Mars Retrograde and the lingering influence of the Super Blood Moon, I drew The Veil. This is a card about the future, yes, but it is just as much about the future-becoming-present. That is its true significance. In the future, anything is possible. It is when the future becomes manifest in the present that possibility transforms into meaning. This card emphasizes that transformation. In other words, look at the things you’ve been anticipating (both positive and negative). The Veil indicates that they are about to become realities. So get ready. 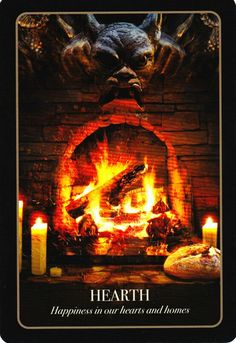 Magical people especially have to keep this card in mind because if there are workings and intentions out there, The Veil says they are doing to create effects, for better or worse. Here, possibility becomes fate. So mote it be. 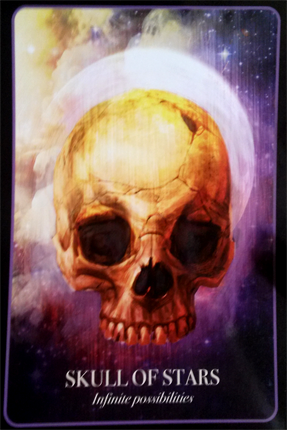 Sometimes, I’m moved to draw a card from my favorite oracle deck, The Halloween Oracle by Stacey Demarco. The deck has both a witchy and a hoodoo vibe (at least to me) and I think the cards are beautiful—which matters a lot if you want to do a reading. I always try to keep aesthetics in mind when considering a deck. Anyway, I asked for today’s oracular guidance and got The Apple, which is all about taking risks. It’s about evaluating risk vs. reward in one’s life. Are you not risking enough to get what you want? Are you putting too much on the line? We engage in this sort of gambling all the time in our lives because we never have complete knowledge or comprehensive information. We usually have to do our best and make an educated guess about the outcome of a particular thing. So I think the questions to ask are: (1) have you done your homework (your research, your investigation) in the matter? (2) are you afraid of “taking a bite”—is the potential for loss / failure too great? (3) are you unnecessarily afraid for some other reason that you need to disregard (i.e. put on your big boy pants and get busy)? Or (4) are you in a place where it would be good to shake things up (even if it’s scary)? The best oracle doesn’t answer your questions for you or tell you, “This is how it will be.” Rather, it helps you see the existing path—with the possible branches, forks, and sidetracks—that begins in your heart and leads outward into the twists and turns of the world. I hope you got something from this reading. I really enjoy The Halloween Oracle and recommend it to people who like that vibe. I should also mention that I do more complex readings right here at Black Snake Conjure, if you’re so inclined. This card talks about needing to dream bigger and consider that limiting beliefs—perhaps unconsciously inherited or acquired at a very early age—have caused one to think rather small. So, once again, one confronts the question: what do you truly want?